This special is one of four Dreamworks Christmas collected on Netflix under the title, "Dreamworks Holiday Classics." While it's not awful, it is an utter waste of time and effort. To be fair, I wasn't a big fan of the movie this was spun off of, though, so your mileage may vary. The story takes place at Snoggletog, a stand-in for Christmas. Everyone's getting ready for the holiday, and they're all excited, since it'll be the first since they enslaved made peace with the dragons. Without warning, all the dragons suddenly take off, leaving the Vikings confused and terrified for no discernible reason. Did I say all the dragons? I meant all but two: Toothless is stuck because he needs Hiccup's help to fly, and Meatlug is stuck, because his owner friend secretly locks him up. Hiccup feels bad that his dragon isn't free, so he makes him an improved tail. Toothless then predictably takes off. Eventually Meatlug is accidentally freed by Hiccup, who winds up being carried away by him accidentally. Meanwhile, the other kids get a sense for what's going on when they find a pile of eggs left behind by Meatlug. They then hide these eggs throughout the town to surprise everyone. Presumably, they do this because kids are stupid. Well, it turns out dragon eggs explode when they hatch, which destroys a number of buildings. 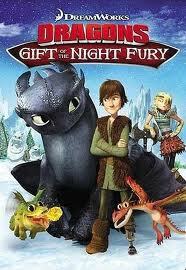 Across the water, Hiccup finds himself on an island where dragons go to lay their eggs. He helps the dragons get their young back, but there's still no sign of his own stupid dragon. Finally, Toothless shows up and regurgitates Hiccup's helmet, which he'd dropped in the water. Toothless then destroys his new tail, so Hiccup will need to reattach the version that requires his assistance. Yes, Toothless has indeed given Hiccup the greatest gift of all: he has embraced his own subservient role as a slave to his human master. Gives you a warm feeling inside, right? So, let's go through the checklist. We've got regurgitation jokes, a pointless plot, and complications due to stupid human behavior that adds nothing to the story but kills some time. And, last but not least, we've got a theme that's actually really troubling if you invest even a shred of thought into its implications. Yup. Sounds like How to Train Your Dragon to me. For what it's worth, the animation is pretty impressive for a special. It's been a while, but it's pretty much what I remember the movie looking like. I'm still not recommending this, though.